Concealed carry laws in Colorado, Idaho and Texas generated considerable anxiety among faculty members and students when they took effect over the past few years. Many feared for their safety. Others worried about whether they could teach controversial topics in the same way. “It felt like the end of the world here,” a professor in Idaho said. Many faculty members at the University of Kansas have had much the same response to the Kansas concealed carry law, which allows anyone 21 or older to carry a concealed weapon in most areas of the university. That law took effect July 1, and fall classes will be the first time faculty members have had to deal with the law with a full contingent of students. To help faculty maneuver through some of the challenges of concealed carry in their classes, CTE has created two new resources on its website. One provides frequently asked questions about how the new gun law might affect teaching and classroom etiquette. The other provides advice on how to spot potentially violent behavior and how to handle overly heated conversation. These are in addition to existing resources about handling hot topics in the classroom and resources that the Provost’s Office has published about concealed carry on campus. KU Public Safety also offers many safety resources on its website. Public Safety plans to increase the presence of uniformed officers on campus in the coming weeks, and officers say that faculty, staff and students should report suspicious or dangerous behavior they observe. Blevins urges people to trust their instincts about danger. Even with concealed carry, it is worth keeping in mind that college campuses are generally safe places, with homicide rates that are a fraction of those for the United States as a whole (0.11 per 100,000 population vs. 4.8 per 100,000). That is certainly reflected at universities where concealed carry is now allowed. Despite widespread concern at the start, there were few lasting effects. Classes went on as planned. Instructors continued to address controversial topics, and there were no incidents in which bystanders were hurt with a gun. That bodes well for Kansas, which is the latest state to allow concealed carry on its campuses. The others, according to the National Conference of State Legislatures, are Arkansas, Colorado, Georgia, Idaho, Mississippi, Oregon, Texas, Utah and Wisconsin. One reason that other states report few problems is that concealed carry applies to a small portion of the university community. The Kansas law, for instance, requires that anyone carrying a concealed weapon be 21 or over, meaning that nearly 60 percent of the student body on the Lawrence and Edwards campuses is not legally allowed to carry weapons. In addition, less than 20 percent of faculty and staff members support the concealed carry law, again leaving a small portion of people who might carry weapons to campus. Another reason is that people have already been carrying guns – albeit illegally – to campus. The concealed carry law made that legal as of July 1. 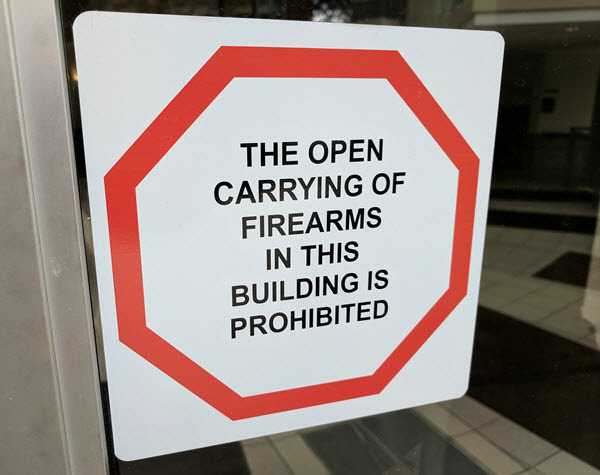 The statute – and the accompanying signs on campus buildings – forbidding guns on campus may have deterred some people, but certainly not all, Public Safety officers say. “We arrest people with guns every year on this campus,” Blevins said. Concealed carry laws certainly raised anxiety on campuses in other states. A professor in Colorado said that state’s law “had a silencing effect initially,” with some faculty monitoring their speech. Another described concealed carry legislation as “an effort to intimidate” and considered carrying pepper spray in response. Some instructors talked about being particularly anxious during office hours, especially because their offices have little foot traffic. Some protested silently by putting signs on their office doors. More recently, an instructor at San Antonio College wore a helmet and bulletproof vest to work to protest the Texas law. There were at least two incidents related to concealed carry. (There may be others, but I found only two of consequence.) During the first semester that concealed carry was allowed in Idaho, a chemistry professor at Idaho State who was carrying a handgun in his pocket accidentally shot himself in the foot. None of the 20 students in his class was injured. Guns certainly carry a risk. Statistics from the National Institutes of Health indicate that workplaces that allow guns are five to seven times more likely to have a homicide than those that don’t. Caesar Moore, police chief at the University of Houston, said in a radio interview in July that although his university had had few problems with concealed carry, he always remembers advice from his early days of police training. Recent research suggests that those most likely to bring a gun to a college campus share two characteristics: They have low levels of trust in the federal government, and they don’t think the police can keep them safe. Another finding of the study meshes with anecdotal evidence about guns on campus: Concealed carry makes many people feel less safe. The risks are real, just as they are in any other setting where thousands of people live, work and interact. The experiences of colleagues at other campuses with concealed carry suggest, though, that the new law is likely to have few visible effects. We can’t – and shouldn’t – discount the anxiety among students, and faculty and staff members. Ultimately, though, we can’t let that anxiety get in the way of helping our students learn. Tagged class discussions, classroom safety, concealed carry.